Therapies that recruit the immune system to attack tumors are revolutionizing cancer care. Among these successful immunotherapies is a class known as "checkpoint inhibitors" that unmask tumors' ability to hide from the immune system. However, checkpoint inhibitors aren't universally successful against all cancers. A University of Colorado Cancer Center study published in the Journal of Clinical Investigation unpacks the actions taken by an especially dangerous cancer type—triple-negative breast cancer—to initiate the process that eventually allows the cancer to become invisible to the immune system. By defining the roots of immune system evasion, researchers hope to develop therapies that could augment those currently in use, making the immune system an even more powerful partner in combatting cancer. The story starts (or, technically, ends...) with a protein called PD-L1. Many types of cancer cells have learned to coat themselves in PD-L1, which is the "cloak" they use to hide from the immune system. The immunotherapies known as checkpoint inhibitors block the ability of PD-L1 to interact with the protein PD-1 found on T cells, thus making the immune system again able to "see" these cancers. But how do cancer cells kickstart their production of PD-L1 in the first place? That is the question CU Cancer Center researchers hoped to answer. And to understand the answer, we need to jump back from the endpoint of PD-L1 into another genetic player called Eya3. 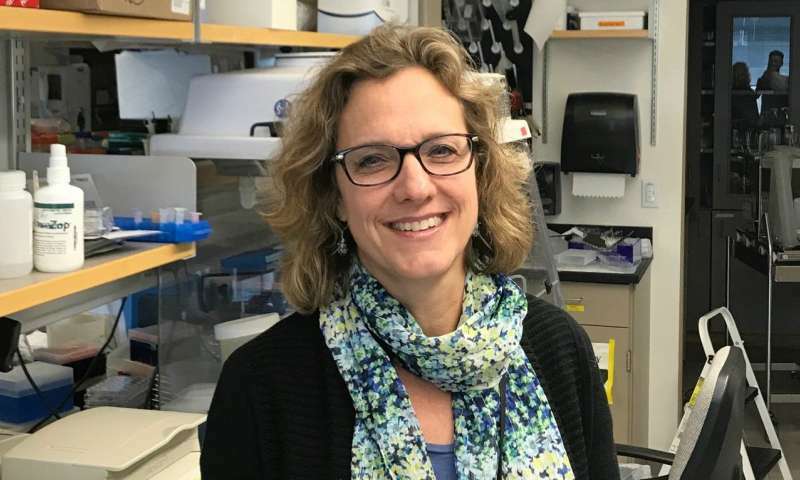 "People had shown that Eya3 was involved in immune responses to viruses, but nobody had examined whether Eya3 could also play a role in evasion of cancer cells from the immune system, nor did anyone know how it works," says Heide Ford, Ph.D., associate director of basic research at CU Cancer Center and the David F. and Margaret Turley Grohne Chair in Basic/Translational Cancer Research. The Eya family of proteins, which includes Eya3, has been an ongoing research focus in the Ford lab. Very basically, Eya's are essential for early embryonic development, but most are silent in adult tissues. The Ford lab and others have shown that when cancers are able to restart the action of Eya proteins, these Eya's work inside tumor cells to drive growth and proliferation. However, Eya's are complex molecules made up of distinct regions that each have distinct functions. And no one had looked at the possible effects of the various Eya regions inside or especially outside of tumor cells. To study how Eya proteins affect a tumor's interactions with a host's immune system, Ford and colleagues used a special kind of mouse model, known as an immunocompetent mouse, in which mouse mammary tumors, that mimic human breast cancers, are transplanted back into immunocompetent mice. This allowed the researchers to explore not only what happens inside living cancer cells, but how these living cells interact with a more realistic microenvironment surrounding them. What Ford saw was a completely new action of Eya3. "We showed that Eya3 can regulate the immune response to a tumor," she says. Basically, doctors and patients would like to see tumors packed with immune system T cells; tumors that are shot-through with "killer" T cells (aka CD8+ T cells) are being eaten by the immune system. In her immunocompetent mouse models of triple negative breast cancer, Ford showed that nixing cancer cells' ability to make Eya3 led to lower production of PD-L1 and higher CD8+ T cell infiltration. In other words, if a tumor couldn't make Eya3, it didn't make PD-L1, and it was attacked by the immune system. "In all of our systems, Eya3 was required for PD-L1 expression," Ford says. "Is Eya3 the only regulator of PD-L1? I don't think so. I suspect there will be other ways to regulate the protein. But in our three models, Eya3 was a key regulator of PD-L1, which argues that Eya3 is potentially a main driver of PD-L1." Sure enough, when Ford and colleagues looked at human samples of triple negative breast cancer, they found that the level of Eya3 correlated with the level of PD-L1. And tumors that had high levels of Eya3 had low levels of CD8+ T cells. Of course, there are other links in the genetic chain that connects Eya3 with PD-L1 and, like Eya3 itself, some of these links are especially complex and even counterintuitive. For example, the gene PP2a usually works to suppress cancer. But in the presence of Eya3, the gene PP2a switched to being a tumor promoter. And, of course, the ecosystem that includes Eya3 and PP2a also includes the well-known oncogene, Myc (which is altered in about 70 percent of all cancers). "There has been study after study showing how Myc affects things like cell growth and metabolism. But the idea that Myc affects the immune system is relatively new," Ford says (pointing to a 2016 study by Dean Felsher's group at Stanford). In this case, Eya3 seemed to be working through Myc to amplify production of PD-L1 and thus suppress the immune system. Though the specifics of this complicated story remain to be defined, the gist is that, "Eya3 may be how PD-L1 is activated in triple-negative breast cancer," Ford says. Could viruses take cancer immunotherapy to the next level?